(Trent Nelson | The Salt Lake Tribune) Myrtle spurge was once planted as a "waterwise" ornamental in Utah gardens, but the resilient plant has escaped yards and is colonizing much of the Wasatch foothills to the detriment of native plants. Neal Dombrowski, a botanist with Red Butte Garden, in a patch of myrtle spurge in Red Butte Canyon, Tuesday, April 24, 2018. Imagine a lovely evergreen ornamental plant that flourishes with little watering even in the driest and poorest soils, spreads with no care and repels deer. Perfect for gardens in Utah and other arid Southwestern states? That’s what the Royal Horticultural Society opined when it gave myrtle spurge an Award of Garden Merit several years ago. But what was once billed as a “waterwise” perennial by Utah nurseries has proven to be an eco-nightmare after the plant escaped residential yards and spread into the Wasatch foothills, where it is forming thick monocultures that crowd out native plants, destabilize soils and undermine biodiversity. Many botanists now consider Utah’s spurge infestation a crisis, but they have few resources to combat its advance. Traits that make myrtle spurge resilient — coupled with a total absence of organisms that prey on it — have turned the plant into an invasive disaster, according to the Utah Native Plant Society’s Tony Frates. (Trent Nelson | The Salt Lake Tribune) Myrtle spurge, seen here in Red Butte Canyon, was once planted as a "waterwise" ornamental in Utah gardens, but the resilient plant has escaped yards and is colonizing much of the Wasatch foothills to the detriment of native plants. Individual myrtle spurge plants and their seeds are long lived. Seedpods explode in May and propel seeds up to 15 feet, and despite the plant’s toxicity, birds further spread the seeds. Known as Euphorbia myrsinites, myrtle spurge is native to the rocky lands of the eastern Mediterranean. Scientists have yet to develop a biological control, typically in the form of an insect or pathogen that co-evolved with the target plant in its native habitat. Of Utah’s 3,930 plant species, representing 151 families, some 3,128 are indigenous, while 792 have been introduced, according to Stan Welsh’s “A Utah Flora.” Fifty-three of these nonnatives, such as Russian olive and tamarisk, are on the state’s official list of “noxious weeds,” which sorts them into four categories according to their prevalence and priority for action. 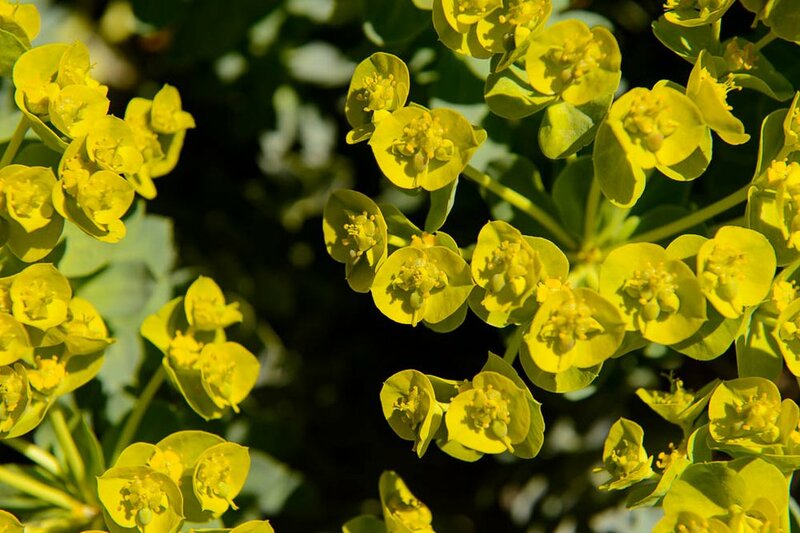 State officials added myrtle spurge to the cast of biological miscreants last year, assigning it to the “prohibited” class, making it unlawful to sell in Utah. But the label otherwise does little to combat the new invader. Some believe authorities should crack down on property owners who allow myrtle surge on their property, as some Colorado communities have done. “If we are to ever have any chance of eradicating this species, cities need to institute mandatory bans, backed up by fines,” said Susan Sims, a board member of the Utah Native Plant Society. 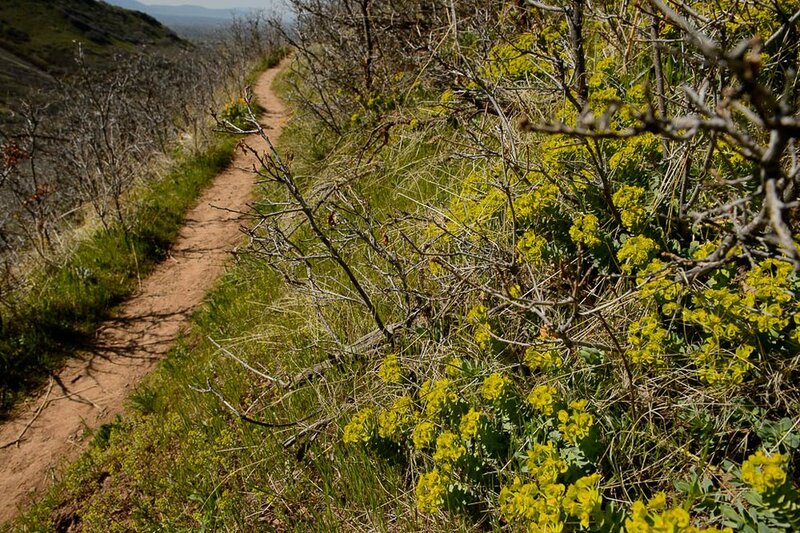 (Brian Maffly | The Salt Lake Tribune) An ornamental plant called myrtle spurge, pictured here in Dry Canyon outside Salt Lake City in late April, has escaped yards and is infesting Wasatch foothills. The nonnative plant has no predators in Utah, where it is now listed as a noxious weed. 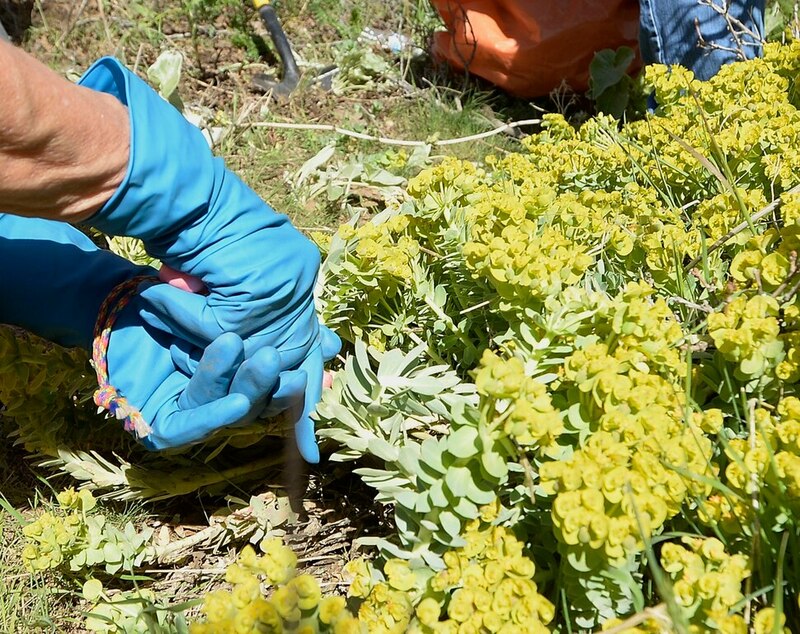 Resembling big overripe broccoli tops, myrtle spurge blankets some hillsides, especially exposed south- and west-facing slopes above Salt Lake City neighborhoods. The infestations are plainly visible to those frequenting the Bonneville Shoreline Trail. Hardest hit are City Creek, Emigration, Mill Creek and Neffs canyons, where spurge is proliferating at an exponential rate. The plant now covers the bottom of Dry Canyon above Salt Lake City’s Federal Heights and soon will move up both sides under the gambel oaks toward the ridgetops. The Utah epidemic likely started in Salt Lake County but has spread into neighboring counties. U.S. Forest Service botanist Mike Duncan has seen myrtle spurge in every canyon he has visited along the Wasatch Front. In coming weeks, several groups are planning weed-pulling events on affected acreage, timed with the spring when the soils are still damp and before seeds mature. While some observers see these pulls as too little too late, organizers say they play an important role. Red Butte Canyon, behind Fort Douglas on the University of Utah campus, is among the least-infected areas, probably because it does not abut neighborhoods, and it is the target of regular public weed-pulling campaigns coordinated by employees of the U.’s Red Butte Garden. 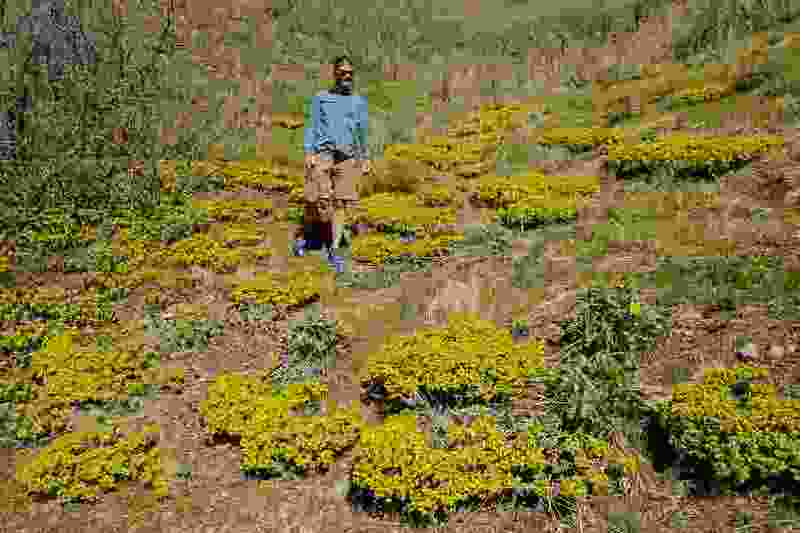 “We will go in and pull huge plants and the next year the ground will be carpeted with seedlings,” said botanist Neal Dombrowski, who co-founded Urban Habitat to promote removal of invasive weeds along the city’s foothill interface. (Trent Nelson | The Salt Lake Tribune) Myrtle spurge in Red Butte Canyon, in late April 2018. Last year, 222 people participated in six pulls around Red Butte. This year, Dombrowski is hosting eight such events, including one May 24 in the Red Butte Canyon Natural Research Area. Plants targeted in the weed purges include Dalmatian toadflax, dyer’s woad and houndstongue. Volunteer teams pull up the plants, which they bag and leave on the ground to allow the sun to break down their contents. Gloves and boots are mandatory for these weed pulls, which are not without their perils. Crews work on steep slopes where a slip can result in a nasty tumble. And when spurge stalks break, they ooze a caustic white sap that can irritate skin and damage eyes. Adding further insult to injury, myrtle spurge lacks a root network that might otherwise hold soils together. Instead, it has taproots that extend up to 14 feet, making the plants hard to pull out and useless for preventing erosion, according to Duncan. Yanking up the plants poses a kind of Catch-22: Invasives will recolonize the open ground unless noxious seedlings are plucked out in subsequent years and native flora are planted in the disturbed soil. Two years ago, U. undergraduate Brianna Milot began studying weed pulls in a research project overseen by the U.’s Environmental and Sustainability Studies Program. She staked out two research plots in Red Butte Canyon, where she documented an abundance of the plant in March 2017 and again this year. She concluded that pulling out the plants reduces the prevalence of myrtle spurge, but only if an area is treated in following years. Jill Pecchia-Bekkum, who works on the nearby U. campus, regularly volunteers at the Red Butte weed pulls. (Al Hartmann | The Salt Lake Tribune) Myrtle spurge, recently designated a noxious weed is growing rampant in the Wasatch foothills. Thursday April 26, 2018 a group of about 100 volunteers mostly from Larry H. Miller businesses march together with shovels and bags up Red Butte Canyon to pull the spurge. Miller employee Brooke Bateman pulls clumps growing beneath scrub oak on a steep slope. (Al Hartmann | The Salt Lake Tribune) Myrtle spurge, recently designated a noxious weed is growing rampant in the Wasatch foothills. Thursday April 26, 2018 a group of about 100 volunteers mostly from Larry H. Miller businesses march together with shovels and bags up Red Butte Canyon to pull the spurge. Miller employee Nolan Harris pulls a clump growing beneath scrub oak. (Al Hartmann | The Salt Lake Tribune) Myrtle spurge, recently designated a noxious weed is growing rampant in the Wasatch foothills. Thursday April 26, 2018 a group of about 100 volunteers mostly from Larry H. Miller businesses march together with shovels and bags up Red Butte Canyon to pull the spurge. Workers use rubber gloves pulling the toxic weeds because the milky sap causes skin rashes. (Al Hartmann | The Salt Lake Tribune) Myrtle spurge, recently designated a noxious weed is growing rampant in the Wasatch foothills. 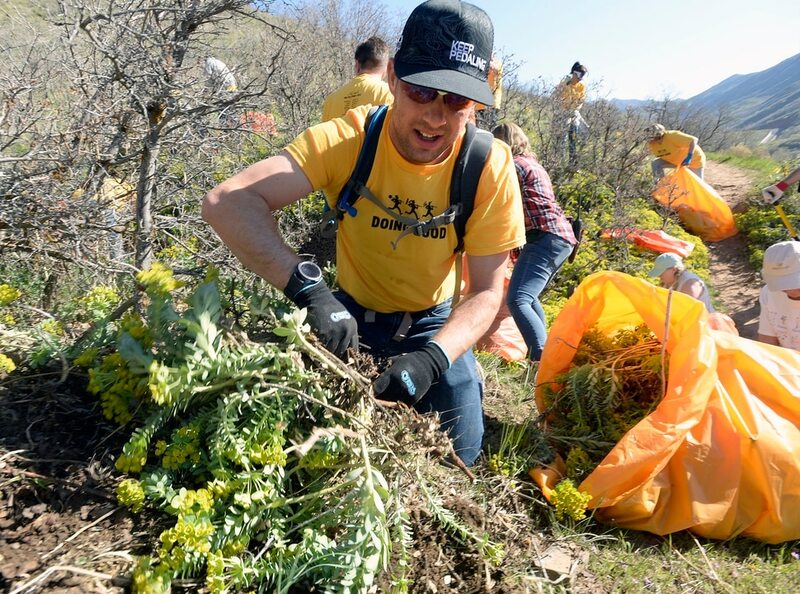 Thursday April 26, 2018 a group of about 100 volunteers mostly from Larry H. Miller businesses march together with shovels and bags up Red Butte Canyon to pull the spurge. Miller employee Anne Henkels pulls fills a bag with the weeds. Bags are collected and taken off the mountain. (Al Hartmann | The Salt Lake Tribune) Myrtle spurge, recently designated a noxious weed is growing rampant in the Wasatch foothills. Thursday April 26, 2018 a group of about 100 volunteers mostly from Larry H. Miller businesses march together with shovels and bags up Red Butte Canyon to pull the spurge. (Al Hartmann | The Salt Lake Tribune) Myrtle spurge, recently designated a noxious weed is growing rampant in the Wasatch foothills. Thursday April 26, 2018 a group of about 100 volunteers mostly from Larry H. Miller businesses march together with shovels and bags up Red Butte Canyon to pull the spurge. (Al Hartmann | The Salt Lake Tribune) Myrtle spurge, recently designated a noxious weed is growing rampant in the Wasatch foothills. Thursday April 26, 2018 a group of about 100 volunteers mostly from Larry H. Miller businesses march together with shovels and bags up Red Butte Canyon to pull the spurge. Desiree Guerrero, a staff member with Red Butte Gardens shows the crews a clump of the plant they will search for and pull-dig out by the roots. Salt Lake County officials declared spurge a noxious weed a decade ago and began a public education campaign. Today, myrtle spurge can be seen growing in many Salt Lake City yards, often metastasizing into neighboring yards and along sidewalks. Alexandra Petri: Trump has done nothing wrong. I think. Are the Rockets actually better than last year? They say it’s possible — and the Jazz probably don’t disagree.